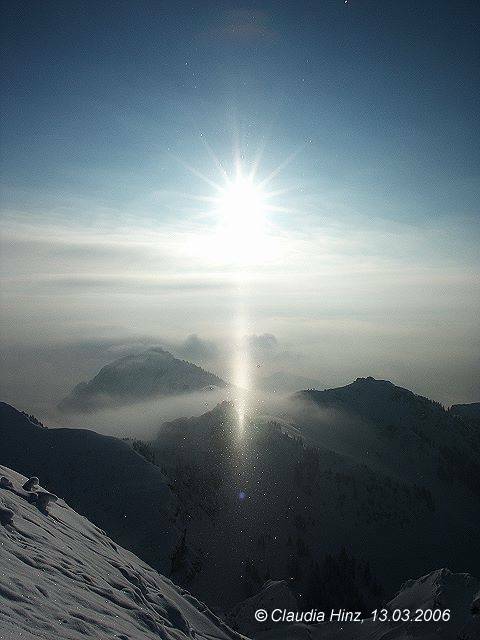 At 13.03.2006 accumulate a diamond dust on the 1835m high top of the German mount Wendelstein above a 1400m high cloud layer, which consists of tiny little snowstars and very long ice columns. Therein forms out a bright glittering lower sun pillar with subsun. After a half an hour both halo kinds weaken clearly, but in return there accumulate two elliptical rings around the sun, before the whole halo spook was disappeared. 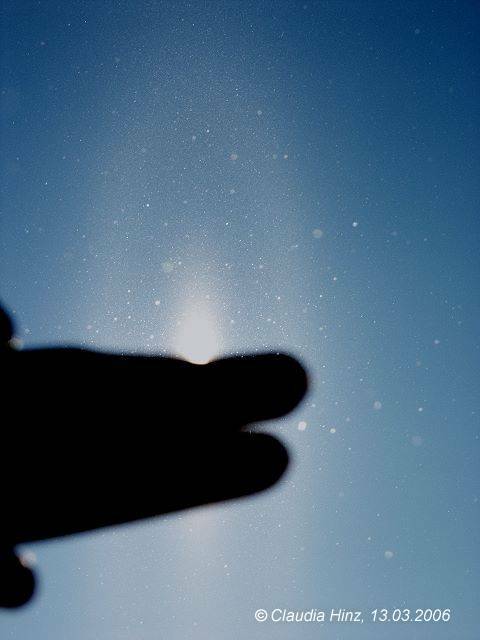 The diamond dust was in the air all over the day, but no halos were observably anymore. When I remember right, the Finns observed ca. 1997 a similarly display with lower sun pillar (and subsun?). Exist a photo from this in the internet? Unfortunately I don't remember that one. 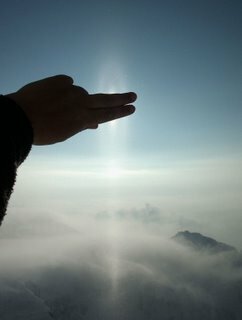 In Resolute in Canada in 1999 Leena Virta and I saw Bottlinger from airplane and when the plane landed elliptical halo. Unfortunately I never seen Bottlinger (to now). But I believe to remember me on an article in "Tähted Ja Aavarus" or "Weather" about. But I've forgotten the author, maybe Marko Pekkola? In which year was the halo meeting to you? This should be the same year of reading the article with the similar picture like mine. claudia I only see one ellipise. Can't grasp any memory. Let's get back to it at the meeting.